Chef Parsons is part of the Cool Chardonnay World Tour Dream Team on Saturday, July 21st. Famous with the Peller Estates name, Executive Chef Jason Parsons has brought his passion of local food and wine to one of Canada’s most renowned wineries. Peller Estates Winery Restaurant has gained recognition as one of the definitive wine and food destinations in Niagara-on-the-Lake, Canada’s premier wine region. Recognized as one of Canada’s preeminent Chefs, Parsons is inspired by the bounty of Niagara’s ingredients from local farmers. Jason takes pride in combining his fine-dining experience with fresh, locally produced ingredients. He is a staple in the culinary industry and has inspired and changed the dining world in Canada and abroad. 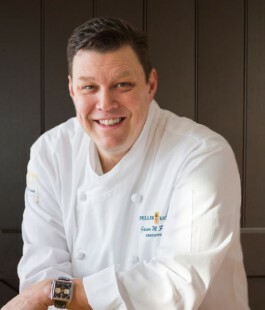 Chef Parsons brings over thirty years of culinary experience to the Peller Estates Winery kitchen that he has gathered from some of the world’s most celebrated restaurants, fusing his support of local Canadian ingredients with his eye for detail. Today, Chef Parsons works closely with Peller Estates’ Winemaker Katie Dickieson, creating inspired cuisine that marries perfectly with the wines of Peller Estates having received numerous culinary accolades such as 4-Star rating from Toronto Life, and being invited to cook in New York at the legendary James Beard Foundation. Jason is also recognizable as a familiar television personality. For thirteen years he has been a Guest Expert on the popular TV show CityLine, entertaining and informing viewers across Canada and Chef Parsons collaborative cookbook with fellow chefs Massimo Capra and Michael Bonacini; 3 Chefs: The Kitchen Men. Now Jason is in his twelfth year at Peller Estates and is continuing to focus on awakening the palates of those that dine in his restaurant. You may recognize Parsons as a familiar television personality. For over twelve years Parsons has been a Guest Expert on CityLine, a popular Canadian daytime talkshow, working alongside some of Canada’s top design, fashion and culinary experts to entertain and inform viewers across Canada. His highly successful appearances sparked Jason to co-author 3 Chefs: The Kitchen Men, Winner of the 2011 Cuisine Canada Taste Canada Gold Medal for Best English Language Cookbook award. Continuing to build upon his legacy Chef Parsons was honored with an invitation to cook and the renowned James Beard House in New York City. Jason showcased his wine focus cuisine for eighty guests and followed in the path of some of the worlds most celebrated chefs. Coming into his tenth year at Peller Estates Jason continues to focus on awakening the palates of those that dine in his restaurant.